Aiseesoft iPhone SMS Transfer for Mac can help users save iPhone SMS to Mac as .txt format, and copy your Contacts on iPhone to Mac as .vcf format. And the .vcf file can be imported to your email system. Also it supports backuping the SMS and Contacts to Mac as a database file. And you can directly delete the backup message as you want. Moreover, this Mac iPhone SMS Manager can support the iPhone 4S, iOS 5 and iTunes 10.5.1.42 now after upgraded. Save iPhone SMS to Mac, and copy your Contacts on iPhone to Mac as .vcf file. 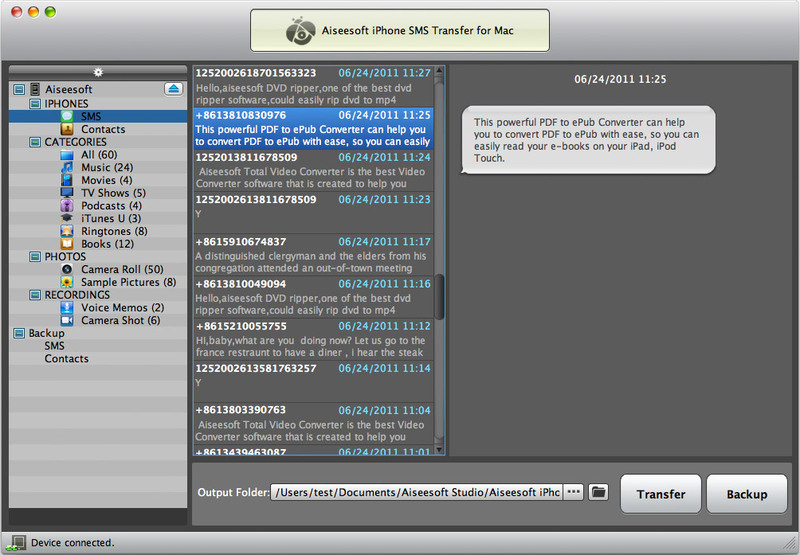 Aiseesoft Mac iPhone SMS Transfer allows users to save all iPhone SMS to Mac as .txt format. Also you can backup the SMS in the program. With this software, users can transfer all the Contact info to Mac and save them as .vcf format. You can also choose to backup the Contact info in the program and local disk. This software can assist you to delete the SMS in the backup files. This iPhone SMS Transfer for Mac owns a user-friendly interface, which can simplify all operations. And you can backup your iPhone SMS and Contacts with few clicks. Qweas is providing links to Aiseesoft iPhone SMS Transfer for Mac 6.1.20 as a courtesy, and makes no representations regarding Aiseesoft iPhone SMS Transfer for Mac or any other applications or any information related thereto. Any questions, complaints or claims regarding this application Aiseesoft iPhone SMS Transfer for Mac 6.1.20 must be directed to the appropriate software vendor. You may click the publisher link of Aiseesoft iPhone SMS Transfer for Mac on the top of this page to get more details about the vendor.